Papa John’s International announced March 22 that NBA Hall of Famer Shaquille O’Neal will be joining Papa John’s as a member of the company’s board of directors and as an investor in nine Papa John’s restaurants in the Atlanta area. O’Neal will enter into a marketing agreement to be an ambassador for the Papa John’s brand. Diane Bondareff/AP Images for Papa John's International Inc. The perennial All-Star and four-time NBA champion turned television commentator, pitchman and serial entrepreneur is joining the troubled pizza chain as what he calls a “triple threat”: its first African-American board member, a brand ambassador and part-owner of nine franchises. O’Neal’s involvement with the company, announced Friday, is a crucial step in Papa John’s efforts to rehabilitate its image after back-to-back racial controversies that crippled sales, depressed its stock price and eventually upended its leadership. The turmoil was ignited by company founder John Schnatter, who was also the company’s chief executive, board chairman and the smiling pitchman known in television commercials as Papa John. In late 2017, Schnatter caused a stir when he blamed a slump in Papa John’s sales on what he saw as the mishandling of NFL player protests by the league. Then, last summer, the company was rocked after it was reported that he had used the N-word on a conference call during a training session. Schnatter said he had used the word not as a slur but to illustrate a point. Nonetheless, he quickly disappeared from the chain’s television commercials and promotional materials as the company attempted to distance itself from its founder. Before long, Schnatter was out as CEO and board chairman too, although he remains the company’s single largest shareholder. “All of that stuff was uncalled-for and unacceptable. It can’t happen,” O’Neal said, adding that the fact “they have new leadership” made him comfortable with being involved with the chain. As a board member, O’Neal said, he hopes to help foster a more inclusive culture in the chain’s corporate offices, where there were also reports of sexual harassment and an otherwise toxic workplace culture. 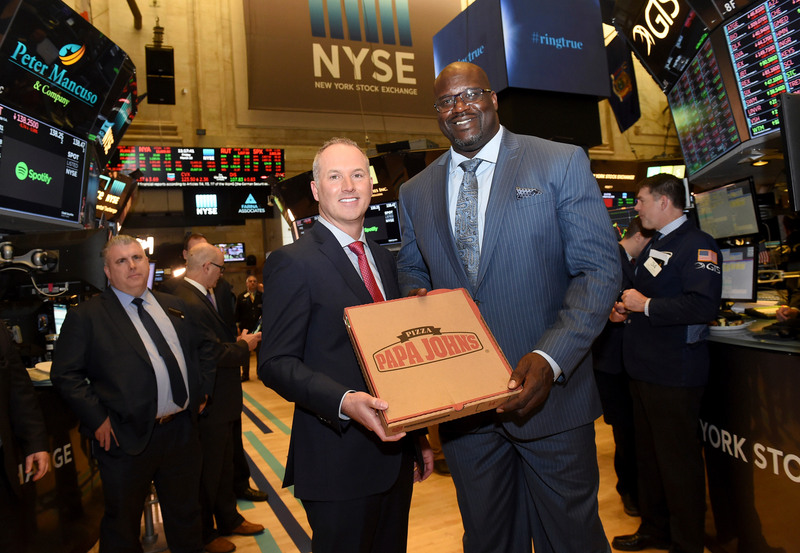 Basketball Hall of Famer and restaurateur Shaquille O’Neal (right) and Steve Ritchie (left), president and CEO of Papa John’s, at the New York Stock Exchange on March 22 after Papa John’s announced that O’Neal will be joining Papa John’s as a member of the company’s board of directors and as an investor in nine Papa John’s restaurants in the Atlanta area. O’Neal has been involved in a broad range of outside businesses since the early days of his NBA career. He said he always admired former NBA stars who have gone on to business success, including Junior Bridgeman, the former Milwaukee Bucks swingman, who owns hundreds of franchise restaurants, and former Detroit Pistons guard Dave Bing, who led a steel company and automotive supplier. O’Neal said he started by buying a book that laid out the basics of business ownership. Since then, he has bought and sold Five Guys franchises, Krispy Kreme stores and Auntie Anne’s locations, among other businesses. He also owns restaurants in Las Vegas and Los Angeles, as well as a piece of the Sacramento Kings.